Priced: $54.45 - $118.95 Rated: - 4 stars out of 5 by 27 reviews. Attach all velcro closures and zip all zippers. Wash in cold water with a powder detergent. Put through two rinse cycles. Dry on medium heat. Retreat your product with a coating of a DWR spray, such as Tectron or Revivex. This maintenance program is only required when water stops beading up on the outside of the garment. FEATURES of The North Face Men's Venture Jacket. SPECIFICATIONS of The North Face Men's Venture Jacket. The North Face Venture Jacket for Men is made to outlast severe rainstorms, featuring a fully adjustable hood with visor and drawcord, pit-zips, center front zip and Velcro storm flap and a hem cinch-cord. This durable jacket is engineered with an eco-friendly HyVent membrane and a waterproof, breathable outer layer to protect you from rain year round. The eco-friendly Venture Jacket reduces the use of synthetic membrane components by 50% compared to traditional waterproof materials. The North Face Venture Jacket - Men's: Engineered to withstand severe rainstorms and styled for everyday use, this lightweight, waterproof jacket is a staple for every outdoor enthusiast. Featuring an attached, fully adjustable hood with visor, pit-zips, and a hem cinch-cord, you’ll stay dry hour after wet hour with this durable rain jacket. Engineered with HyVent® DT EC, a new material derived from natural castor oil from beans, this eco-friendly jacket reduces the use of synthetic membrane components by 50% compared to traditional waterproof materials. Editors’ Choice Green 2011 award from Backpacker magazine. Attached, fully adjustable hood with hidden drawcord system. Center front zip and Velcro® closure. Stowable in left hand pocket. Length from Center Back - 28in. Fabric - 20D 2.7 oz/yd2 nylon ripstop. When you know a downpour is just moments away, reach for The North Face Venture Jacket. Waterproof, breathable, and seam sealed, the Venture is the ultimate rainwear piece designed to keep you dry and comfortable. Pit-zips for circulation to your core on warmer days, an updated hood for greater protection, and adjustable cinch-cords complete the package on this durable choice for protection from inclement weather. 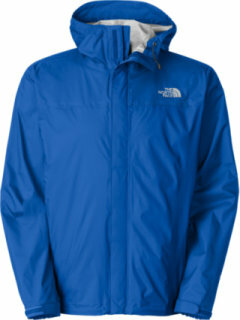 The North Face Venture Jacket is highly technical rain gear, conveniently styled for everyday use. Featuring nylon ripstop HyVent™ DT, the Venture Jacket delivers waterproof, breathable, and durable protection. Finishing details include an attached, fully adjustable hood, a brushed chinguard lining, armpit-zip vents, and center front zip/hook-and-loop closure. Flexing more than a few key features like breathable fabric, underarm zips and supreme packability, The North Face Men's Venture Jacket stands apart from the its rainwear competitors. And what's a rain without weatherproofing? Hyvent 2.5L fabric and seam sealing offer a level of waterproofness that fends off everything from light drizzles to serious downpours. Now you're beginning to see why this jacket was awarded Backpacker Magazine Editor's Choice in 2011. Classic, year-round rain shell constructed with HyVent® fabric, the men's Venture Rain Jacket from The North Face is engineered to withstand wilderness storms and is styled for everyday use. A little (or even a lot of) rain won't spoil your ventures when you've got this jacket from The North Face® tucked in your pack. HyVent® 2.5L EC features a durable, waterproof outer layer paired with a breathable, polyurethane-coated inner layer that allows water vapor to escape. Velcro® storm flap over full-zip front closure. Underarm zip vents dump excess heat quickly. Jacket can be stowed away in the hand pocket for ultimate portability. Logo embroidery at left chest and right rear shoulder. HyVent® 2.5L EC 100% nylon ripstop (50% non-petroleum membrane). Made of an environmentally friendly membrane, The North Face Venture Jacket offers a waterproof, breathable outer layer with modern lines that will protect you from rain year round. A lightweight, waterproof and breathable jacket for all around exploration and changing conditions. The North Face® incorporates their own HyVent® DT process to provide exceptional performance at a super price! Classic, year-round rainwear constructed with recycled HyVent 2.5L, this jacket is engineered to withstand wilderness storms and is styled for everyday use. Classic, year-round rainwear, now constructed with HyVent® 2.5L EC fabric, an eco-conscious material; our most popular waterproof, breathable jacket. 5 people have already set their own price. The North Face Venture Jacket is really a waterproof shell, so there is no internal insulation for warmth, but it does an amazing job of keeping you dry. This was fantastic when it rained during my hike one summer, or when I'm out fishing on a boat. Not every jacket needs insulation so please don't mark down a jacket to one star because of this. The hood is an engineering marvel because there's like this built in mini visor that prevents the rain from running into your face and it has elastic cords to secure the hood comfortably to your head. It is a noisy coat as most shells are and the price was a little high ($99 for me at the time), but I actually think it was worth the investment. Also, this sucker can be rolled up tight, probably to the size of a 20oz beer can, so it's great for travel. One word of caution: while there isn't insulation there is some sort of coating inside, and the North Face shell I had before this one had the same thing and began to peel to the point where I had to throw it out - these little flakes just peeled everywhere. However, so far this one hasn't had the problem and I hope North Face has looked into this issue. Hope this helps! Fit is typical North Face?that is to say a little more generous than most brands (ArcTeryx, Marmot & Patagonia typically run more snug in my experience). So it just depends on what you like & how you'll use it. I'm 6ft, 200 lb & on me it fits well over a micro fleece sweater & packable vest. Can't go wrong with this for everyday use, especially if you get a great Backcountry price! It will keep you dry & not overheat. I love this jacket! First of all this is an outer layer jacket, if you need to be warm you will need some layers under it to do so. This jacket is meant to keep you dry in the rain and it does an awesome job of doing that. I used this on my mount Whitney summit and it kept me dry through a 2 day thunderstorm. I can't say enough about this jacket. It is super light and works amazingly, I was totally dry while wearing it. I want to also thank the amazing costumer service who upgraded my shipping for free to make sure it got here in time for my attempt to summit Whitney. They were greatly helpful and very kind. This is my go to jacket (in combination with a light synthetic sweater) for anything alpine summer-fall. Nice and light, packs up well enough, and is quite durable. It has held up on numerous alpine rock climbs this summer. It is very wind and waterproof, however, it is inherently not as breathable or durable against sharp, pointy objects as a thicker softshell. It's a tradeoff, but one that I am willing to make for the wind resistance and packability of a hardshell for alpine climbing. The fit is pretty true to size, roomier than arcteryx, similiar to patagonia and OR, but slimmer in the stomach than patagonia. Works very well with a thin-ish layer underneath. Been using this jacket for about a year now and I must say I love it. Bought it as an alternate to wearing something heavy like my winter parka during those wet summer months we sometimes get in UT. This past summer was ridiculous with rainfall and I may have drowned without this jacket. Wonderful for tailgating, hiking, or taking the dog for a brief adventure. The large was a bit roomy leaving me enough room to layer when needed but without the excessive baggy look. I definitely recommend this jacket to someone looking to stay completely dry in a wet environment. I had this jacket for 8 years and loved how light and waterproof it is. I also loved how perfectly it fit: I usually wear a large and a medium size fits me perfectly. Unfortunately though, after years of traveling around the world in it, the jacket's inner liner started to peel and water started soaking through... however, I brought it to a TNF store and they replaced it with a new one! I still miss my original jacket though - so many great memories. Great jacket! Light and easy to pack. Does great in the wind, I've hiked a few 14ers in Colorado with it when the wind is blowing and it does a great job of not letting it get to you. Been in down pours too and it kept me dry (I did try and find tree cover just to be safe). Great for backpacking though, I've had no problems with it at all. Can't beat the price at backcountry! This is my second one. First one lasted about 5 or 6 years with heavy use; lots of backpaking, hiking and standing in the rain watching football. They run a little big as they should so you can wear something underneath. No need to go up or down a size though. I bought this jacket under the soft shell title. In the picture it looks as if it has some type of lining but it doesn't. It feels plastic. I looked online and it is no longer under soft shell and is now under rainwear. I will be returning it and selecting another one. I overall love the company. It is a windbreaker outwear, no lining, no inner pocket. It is very thin, no wool or cotton padding or insulation of any kind. It is not what I expected, that is why I returned it. Yes, if you will move your arms it will make noise. i was disappointed in how harsh the black color is (I couldn't tell from the internet picture): I bought it to replace a soft-black one whose lining started to disintegrate. I don't remember how the pockets were on the old one. the new one has two side mesh pockets that sit loosely inside the jacket. I mistakenly thought they WERE inside pockets. My first outing, I was running shopping errands, dropping my credit-card receipts and some money into the left "pocket" only to realize, when I got home, that all my credit-card receipts plus $7 were missing. It seems North Face could have designed the side pockets so they would also function as inside pockets: THAT would have been a design worthy of NF (I have an NF tent and sleeping bag, both of which I think are super). I'll be leery of buying their clothes again. Had this jacket for about 6 years and really like it. It's my go-to jacket when it's raining hard. When it's warm out I wear it over my T-shirt. When it's colder I wear it as a top layer. But several years ago the liner started peeling, especially in the neck and hood area. What a mess. I don't wear the jacket long enough to have it effected by sweat, lotions, hair cream, etc. It's going back for a warranty repair/replace and I'm hoping TNF honors the warranty. I didn't think of this until I read some other, reviews but the hood is way to large. When I need to use it I have to have one hand keep it from falling over my face. Maybe TNF will replace my jacket with one with an improved lining and a smaller hood. I certainly hope so. I've owned two of these. In both cases the lining started peeling in the hood after about a year's use, and within a month had gotten real grotty. I'm not into having to buy a new one every year. Secondly, the earlier version of this the inside pocket netting extended down to the hem creating too large "bin" or "bucket" or "magazine" pockets - the main reason I bought the jacket, in the city these kind of pockets especially convenient for books and shopping In the current version, they took that extended netting out and you're left with only two hand-pockets. Other than that, the jacket looks great, the waterproof is great. Now if they reinstated the bucket pockets and fixed the peeling I'd be happy to buy another. Well I bought this for my son a teenager a large size and my only problem was that the size ran smaller then what I thought would fit him I kept it and gave it to my other son who I regularly buy medium size for.